API Manager provides policy-based integration with external identity providers using Lightweight Directory Access Protocol (LDAP). For example, this enables internal API Manager users such as API administrators to use their existing LDAP user account to log into API Manager. However, they must still use their LDAP identity provider to perform tasks such as changing their LDAP password. 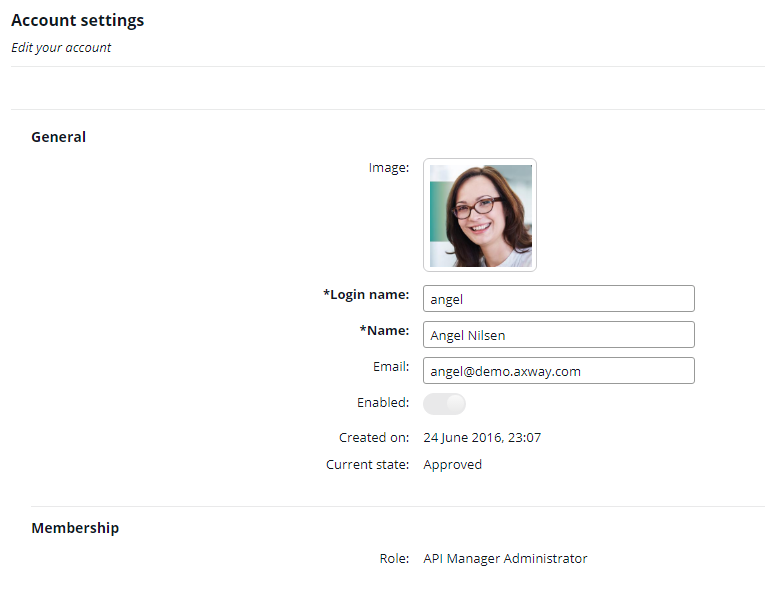 API Manager supports a hybrid mix of external LDAP and API Manager identity providers. For example, you can configure an external LDAP identity provider such as Apache Directory or Microsoft Active Directory, and also create external users in API Manager. Users created in API Manager are authenticated against the Key Property Store (KPS) and stored in the Apache Cassandra database. You can also use your existing external LDAP identity provider to store external users and developers. Users managed in the external identity provider do not need to be created in API Manager, and are automatically created on first user login. API Manager does not store passwords for these users. Users not managed in the external identity provider are created in API Manager by the API administrator or by self-registration. API Manager stores the full user profiles and passwords for these users in Cassandra. If the user exists in Cassandra, API Manager checks the password for the user stored in Cassandra, and grants access. At first login, API Manager automatically creates the user in Cassandra, stores the login as a read only field (the credentials remain in the external identity store), and a role is automatically assigned using the configured policy. For subsequent logins, API Manager will have the user login in Cassandra, and will check the user credentials in the external identity store. Roles can also be changed by the API administrator in API Manager. API Manager provides sample external identity providers for LDAP based on Apache Directory and Microsoft Active Directory. This topic explains how to configure these sample providers using the Policy Studio and API Manager tools. This section explains how to configure an Apache Directory LDAP external identity provider. Note All user passwords are set to pass. For more details, see the Apache Directory Studio User Guide. In the Policy Studio tree, select Server Settings > API Manager > Identity Provider > Use external identity provider. Click Apply Changes at the bottom right. Enter the appropriate value in the Organization selector field (for example, Community). Click Deploy in the toolbar to deploy the updated configuration. On-board a user from the Apache Directory LDAP server by logging in with the appropriate user credentials (for example, the wbligh user). Note The Login name for an external user (provisioned by an external identity provider) is read-only and cannot be changed. 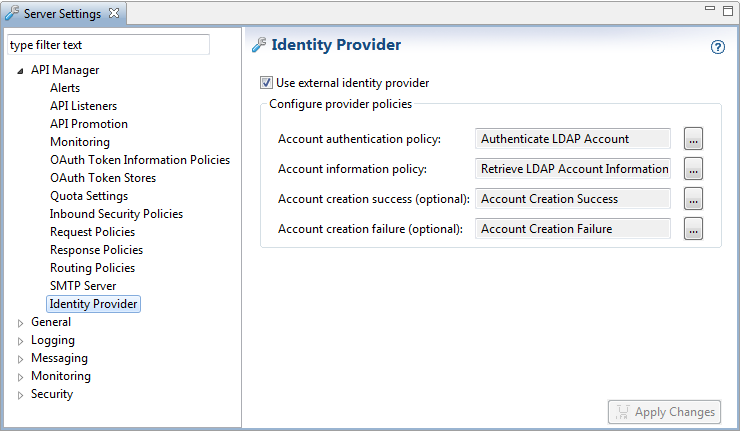 This section explains how to configure a Microsoft Active Directory external identity provider. In the Policy Studio tree, select Server Settings >API Manager > Identity Provider > Use external identity provider. 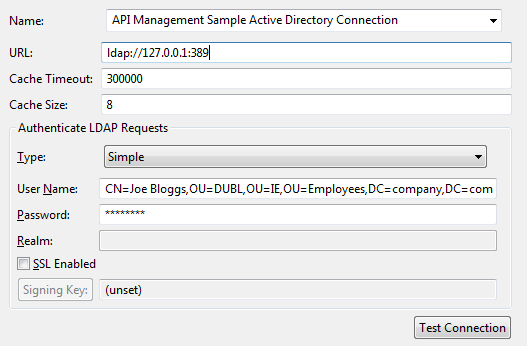 In the Policy Studio tree, select Environment Configuration > External Connections >LDAP Connections > API Management Sample Active Directory Connection. URL: Enter the URL for your LDAP server (for example, ldap://127.0.0.1:389). User Name: Enter the distinguished name of the user to connect to the Active Directory (for example, CN=Joe Bloggs,OU=DUBL,OU=IE,OU=Employees,DC=company,DC=com). Note This user must have Read MemberOf (search) privileges. Password: Enter the user password. Click Test Connection to verify that the configuration details are correct. 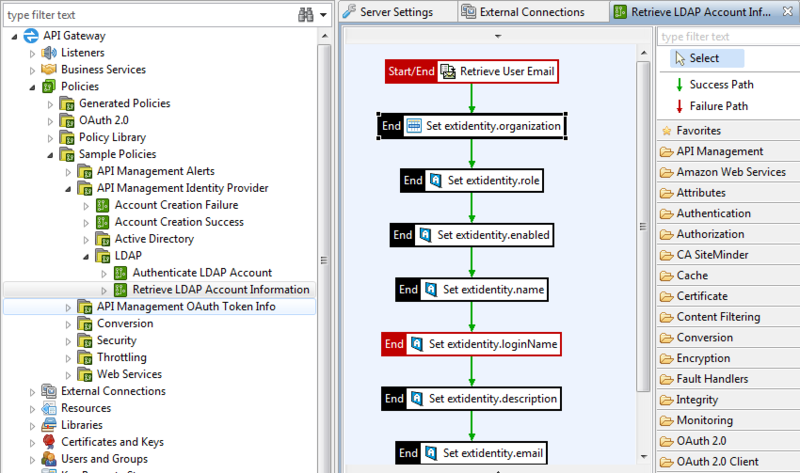 Select Environment Configuration > External Connections > Authentication Repositories > LDAP Repositories > API Management Sample Active Directory Repository. Right-click, select Edit Repository, and enter the Base Criteria (for example, OU=Employees,DC=company,DC=com). This is the starting point in the Active Directory hierarchy at which the search for users will begin. Optionally, if the community organization is not named Community, or if you wish to on-board users to a specific organization, edit the Set.extidentity.organization filter in the Read Active Directory Account Information policy. 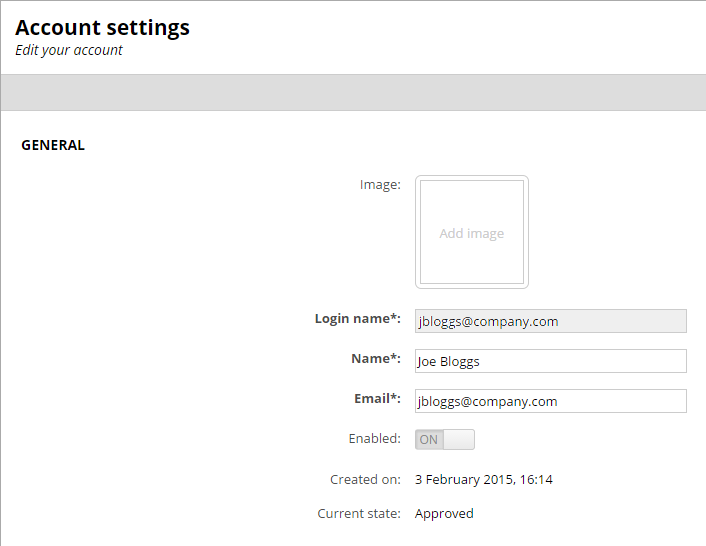 On-board a user from the Active Directory server by logging in with the appropriate user credentials (for example, a jbloggs user). extidentity.organization.id The organization ID (required). extidentity.enabled User is enabled only if the selector evaluates to 1 or true. extidentity.name The user’s name (required). extidentity.description A description of the user. extidentity.email The user’s email address. extidentity.phone The user’s phone number. For details on how to create custom policies, see the API Gateway Policy Developer Guide.